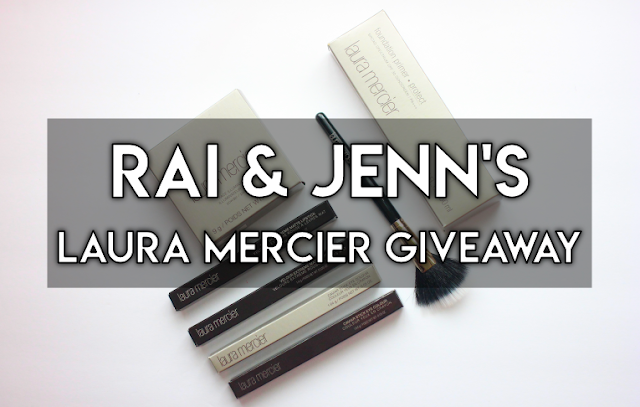 Glam Morena: Giveaway Alert: Laura Mercier Giveaway! Giveaway Alert: Laura Mercier Giveaway! I've teamed up with Jenn of Spiced Beauty to bring you a Summer giveaway. 1 of our lucky Instagram followers will win $200+ worth of Laura Mercier products! This giveaway is opened internationally. Prizes Include: Laura Mercier Face Illuminator in Indiscretion, Laura Mercier SPF Foundation Primer, Velour Extreme Matte Lipstick in Fresh & Control, Laura Mercier Caviar Stick Eye Colour in Au Naturel & Smoke, and Laura Mercier Fan Powder Brush. Please Note: You can double your chances of winning by making sure to follow, like the post, and tag 2 friends on both of our Instagram pages. You can also earn an extra entry and extra Laura Mercier prize for reposting the giveaway on your Instagram page!